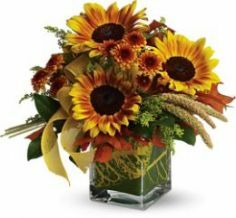 It’s delightfully contemporary and a little bit country – with sunflowers fresh from the field artistically arranged in a chic cube vase. Surprise someone who will appreciate both. 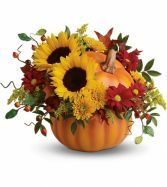 Sunflowers, Small, Cushion Spray Chrysanthemums, Yellow, Daisy Spray Chrysanthemums, Red, Solidaster, Huckleberry, Block Floral Foam, Each Liner, Each Lid Pick, Each Telefloras Pretty Pumpkin H.
Bring the pumpkin patch indoors with a hand-painted ceramic pumpkin filled with a rustic autumn bouquet. While you're at it, make autumn even more awesome for faraway friends. The feel of the season is finally upon us. 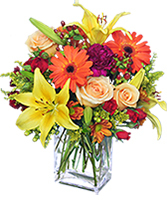 Send this charming bouquet to brighten someones day. 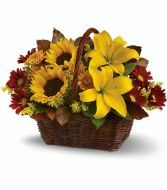 Call A Courtyard Florist direct or order your flowers online today!